I've used a Lyman Electronic Trigger gauge for as long as I can remember. 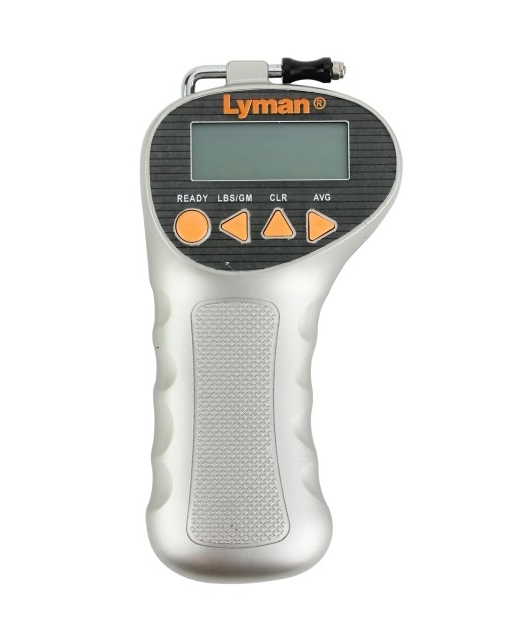 My original still works, but Lyman has improved it with their current model: Lyman # 7832248 Trigger Pull Gauge Electronic Digital 0 to 12 lb. No longer do you screw on the pull extension, it handily collapses into the housing. The older Lyman used a 9V battery, this current version uses a pair of AAA batteries that are included. You might wonder why you really need one? Mass-produced guns have triggers that are erratic as finished products. In the case of some older shotguns like the Browning Auto-Five, the triggers are built upon metal, and they were universally good. I just grabbed one of my Belgium Light Twelves: the trigger breaks very crisply at an average break weight of 3 lbs. 2 ounces. The days of an average field repeating shotgun having a 3-1/4 lb. trigger are long gone. Part of the problem is the trigger groups themselves: most are currently built upon plastic locks, with most everything pinned in place. The plastic foundation can stretch and factory-adjusting triggers is hand-work that costs money, so it is avoided. A good field trigger is about 4-1/4 lbs. or so, a good target trigger 3 to 3-lb. pounds. All too often, shotgun triggers in particular break at a weight that exceeds the weight of the entire gun. If you carry your Lyman trigger gauge with you when you are gun-shopping, you can save yourself the time and hassle of an aftermarket trigger job. Gun manufacturers often apply a generous amount of wishful thinking when it comes to their published gun weights. I've been told, on several occasions, that the reason my gun is three-quarters of a pound heavier than the published weight is “wood density.” It is a pity that the factory comedian on the other end of the phone was oblivious to the fact that the gun in question was made with a synthetic stock only. It sure is good to know what exactly you are getting before you pay for it. Countless times guns are offered that are “lightweight,” with light and crisp triggers. That type of vague description tells the consumer a whole boatload of nothing. One example is the Browning Maxus. “A solid performing trigger is something usually reserved for rifles and seldom found on shotguns. You will, however, find one on the Maxus. In fact, we're so impressed with the new Lightning Trigger System in the Maxus, we think it might be the finest ever offered in an autoloading shotgun. The Lightning Trigger is designed to offer a smooth, crisp feel with minimal travel.” That's what Browning says. It may well “be designed” to offer a smooth, crisp feel but none of the six or seven Maxus models I've tested were manufactured that way. While Browning may well “so impressed” with their own trigger, no one else is . . . I'm sure not. It is more work for Precision Sports in Oshkosh or Cole Gunsmithing, but catalog ad-brags hardly reflect reality. Browning is hardly alone, most manufacturers happily misspeak (lie) about reliability, recoil, and everything else. As for who makes the “most reliable, fastest cycling, best-handling, softest shooting shotgun in the world” … well, everyone makes “that” model. Can't you read a catalog? Forewarned is forearmed and a Lyman trigger gauge can help you avoid buyer's remorse when it comes to trigger weight, safety weight, and gun weight. It sells for about sixty dollars, and will pay for itself many times over the first time it stops you from buying what you don't want.